15:12 | Caracas (Venezuela), Jan. 29. 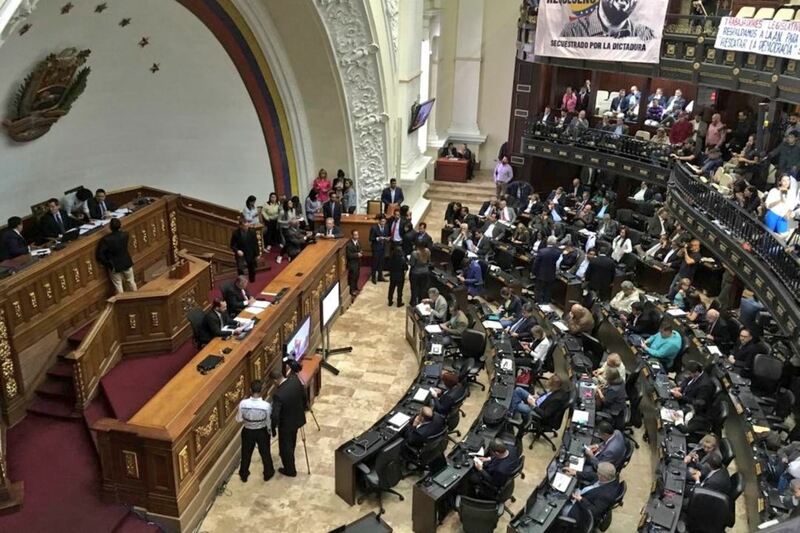 The opposition-controlled National Assembly of Venezuela on Tuesday named diplomatic representatives to 10 countries that recognized the self-proclamation of Juan Guaido as Interim President of said country. Henceforth, the Venezuelan Government —led by Guaido— will have diplomatic representations in Argentina, Canada, Colombia, Costa Rica, Ecuador, the United States, Honduras, Panama, and Peru, as well as the Lima Group —a bloc formed by several of these nations, which refuses to recognize the socialist Nicolas Maduro. ??? ?Ecuador: Rene de Sola Quintero.
? ?Grupo de Lima: Julio Borges. Guaido headed the parliamentary session that confirmed the nominations. Plus, he took the opportunity to address the 2.3 million Venezuelans who —according to the UN— have fled the crisis-wracked country since 2015. "We miss you. There go your representatives, who will look after your interests but also your imminent return home," the congressman said to applause. The Chamber did not specify the location of the envoys' workplace. "We are exercising the powers (of the Executive Branch) to stop usurpation, ensure a transition process, and hold free elections," he affirmed. As is known, the Venezuelan opposition leader assumed the powers of the presidency on January 23 after thousands of protesters marched against Nicolas Maduro's new term in office. In this sense, the Peruvian Government recognized him as Interim President of the Bolivarian nation. Peru's Foreign Affairs Ministry also expressed its support for the National Assembly chairman, who assumed the post of Interim President in response to Maduro's illegitimate regime. According to Guaido, his swearing-in took place within the framework of the fight against the usurpation of power in Venezuela. Likewise, other countries voiced support for him, such as Argentina, Brazil, Canada, Chile, Colombia, Costa Rica, Guatemala, Honduras, Panama, and Paraguay through the Lima Group. On January 4, the group announced it would not recognize the legitimacy of Maduro's new government. The Organization of American States (OAS) adopted the same stance. Thus, Peru banned the entry of Maduro and 99 members of his regime —including their relatives— to its territory. It also withdrew its Charge d'Affaires from Venezuela and deemed the Maduro administration as a dictatorship.